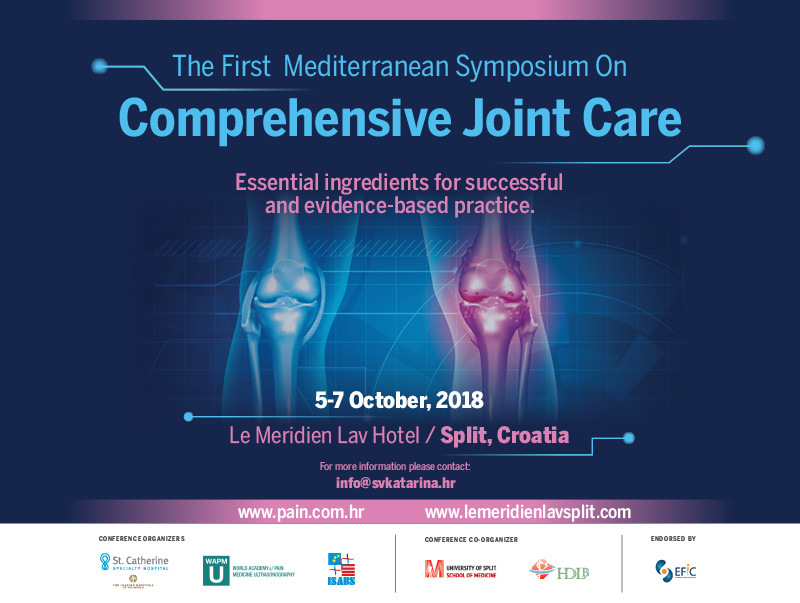 On behalf of the Conference Scientific Committee, we invite you to attend First Mediterranean Symposium of Comprehensive Joint Care to be held in the hotel Le Meridien Lav, Split, Croatia, October 5-7, 2018. Conference organisers are World Academy of Pain Medicine Ultrasonography, International Society for Applied Biological Sciences, University of Split School of Medicine and Specialty hospital St. Catherine endorsed by European Pain Federation, Lecturers, coming from eight countries, are world renowned experts in the fields of pain management and orthopaedics They come from some of the most prestigious universities in the world, such as Stanford University, Mayo Clinic, Wake Forest University, Penn State University, University of Toronto, Innsbruck Medical University, Maastricht University Medical Center etc. The comprehensive program of the Symposium will include topics such as repetition of anatomy of the musculoskeletal system, modern radiological diagnostics, pathogenic mechanism of osteoarthritis and conventional and innovative methods of treatment of osteoarthritis. Lectures will discuss state-of-the-art methods of osteoarthritis management, such as application of mesenchymal stem cells, PRP, BMCA, denervation of joints and peripheral nerve stimulation. The last day of the Symposium is reserved for hands-on practical workshops, where participants will learn all about the application of the latest diagnostic and treatment methods. Workshops will present cell harvesting in regenerative medicine, intraarticular and periarticular application of therapy, ultrasound diagnostics, possibilities of treatment of large joints by manipulation of nerves etc. You may wish to know more about the conference venue, the city of Split (the “Pearl of Adriatic”) is a UNESCO World Heritage Site and a charming gem of the Adriatic. The story of Split is already 17 centuries old, dating to the time the Roman Emperor Diocletian decided to build his Palace right on the peninsula near the great Roman city Salona, where he wanted to spend the last years of his life... We are sure you would enjoy it!